Original Epiphone catalogs, flyers and price lists are key documents that help to understand the company's product history. However one has to keep in mind that actual production models/examples often differed from catalog descriptions and specifications. 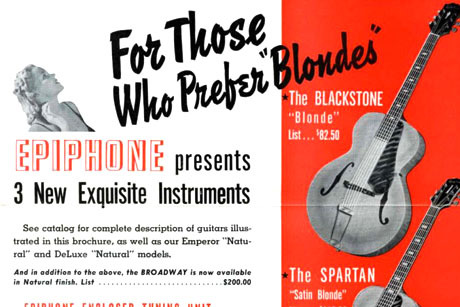 Below a selection of Epiphone sales literature from the 1930-50s period. If you own (or have pictures of) one of these or other pamphlets that are not listed below please let me know. Thanks so much! For Those Who Prefer "Blondes"